In August of 2012, my friend Brian Spiewak and I ventured to Bridgeport to check out the Incredible Hulk. Our goal was to backpack in and climb the route Positive Vibrations; a 1200’ 5.11a. 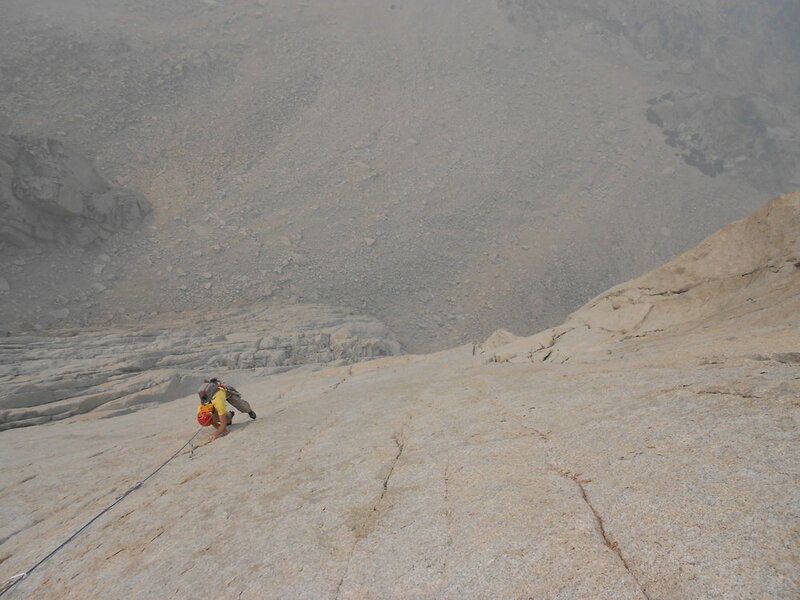 This route was a big deal to me because it was my first difficult route in the High Sierra. Positive Vibes takes an amazing line up the left-center of the Hulk. Directly to the right of Positive Vibes lies the route Venturi Effect. While Brian and I were fighting our way up Positive Vibes, there was a team on Venturi Effect. Watching these two cruise up Venturi was inspiring to say the least. I was able to talk to the leader while he was at belays, and he said that the route was amazing and safe enough for the grade. This resonated with me and I began to think that maybe someday I would try to climb Venturi Effect. Fast forward to May of 2013, I had just finished with my last final of the semester and my friend Adam Torres and I were shredding up Interstate 5, headed to Yosemite Valley. We decided to wander up El Capitan’s Salathe Wall for two days just to see how far we could get. Over the course of those two days I was served a huge slice of humble pie, falling off every pitch harder than 10c. Beaten and tired, we retreated from the top of the 14th pitch. Instead of being discouraged by my inability to send a single 5.11 pitch, I decided to use this trip as motivation to become an all-around stronger and better climber. After returning from the Valley I began to spend as much time as I could climbing and conditioning. This meant putting in long gym sessions during the week and getting outside to get as much mileage on granite as possible. I started making trips to Riverside Quarry with my friend Josh Higgins. Josh has been climbing for about fourteen years, and he is one of the best all-around rock climbers that I know. Over the course of our numerous Quarry trips I learned how to move efficiently on difficult terrain, rest effectively and red point hard sport climbs. As the summer progressed, I noticed the training paying off. My fingers were getting stronger, my endurance was improving, and I wasn’t getting injured. I began to think of routes that would put my new found fitness to the test and only one came to mind, THE VENTURI EFFECT. With two pitches of 10-, four pitches of 11+, two pitches of 12-, and two pitches of 12+, it would be the most difficult and sustained multi-pitch crack climb that I had ever tried. I enlisted Josh to climb the route with me because of his insane pitch after pitch endurance and his outstanding crack technique. We set a date to head out to the Hulk and began casually planning the trip. Before I knew it we were in the car blasting up the 395 toward Bridgeport. In casual conversation, I asked Josh which pitches he wanted to lead. “It doesn’t really matter to me”, he replied, “I’ve been too busy to look at the topo.” I laughed nervously and began to explain how many hard pitches we were going to have to climb. Reality set in for Josh as I read off the pitch ratings from the topo. The Venturi Effect would not go down easily, and we both laughed and joked about how the route was going to destroy us. Josh and I arrived at the Bridgeport ranger station early Friday morning to pick up our permits. We packed while waiting for the station to open, splitting the gear and rope between our backpacks. The hike went quickly and about three hours after leaving the car, we arrived at our base camp. With our afternoon free, we decided to set up camp and climb the first few pitches of Venturi Effect to get a feel for the climbing. We quickly hiked to the base of the route and roped up. Unfortunately, in the meantime smoke from the Rim Fire was starting to wisp into the canyon as I racked up to lead the first pitch. The super crimpy lieback start caught me off guard and made me try hard right out of the gate. Luckily, the pitch eased off in difficulty for a bit, and I was able to relax and cruise through the middle section. After climbing an awkward corner I cut left into a strenuous undercling section. Unable to place gear, I ran it out about fifteen feet to clip a bolt. Then it hit me, I was pumped! I tried shaking out on some bad holds and came to the realization that I couldn’t breathe! I felt like I was doing wind-sprints in Sycuan Casino! I was sucking in thick smoke with every deep breath, which was adding to my pump. With haste, I started punching it out an undercling/ lieback flake hoping for a better rest. Finally I found what I was looking for! A bad knee-bar and an awkward handjam allowed me to shake out and slow my breathing. 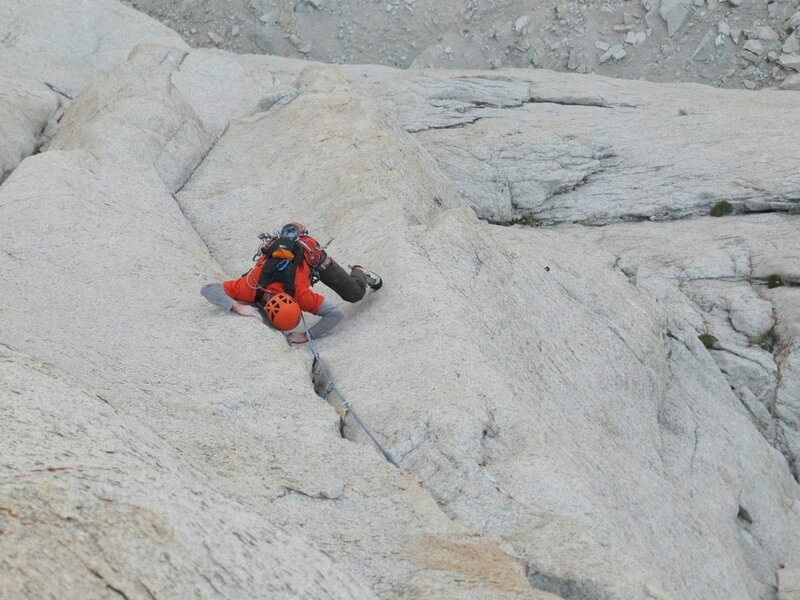 After resting adequately, I fought my way up the rest of the pitch battling heinous rope drag for the last twenty feet. Exhausted, I clipped into the anchor and belayed Josh up the pitch. Josh dispatched the 180-foot pitch with little effort and quickly took the lead on the 5.10- second pitch. After I followed Josh up the pitch, our eyes and lungs were burning and we could tell that the smoke was rolling in too thick to continue climbing. We hung out on the ledge for a few more minutes before rappelling back to the ground. Doubt began to set in as we reached the ground. “If I struggled on 11+, how am I going to be able to lead my 12+ pitch … or any of the other hard pitches! ?” I tried to push these thoughts out of my mind as we ate dinner and went to sleep. The next morning greeted us with clearer skies and less smoke. Josh and I quickly drank coffee and ate a light breakfast. Without delay, we hiked back up to the base of the route. We decided to switch things up. Josh racked up and tied in to lead the first pitch. He cranked past the crimpy crux, through the awkward corner, and out the pumpy undercling easily. I quickly followed, finding a few extra knee-bar rests that I had missed the previous day. 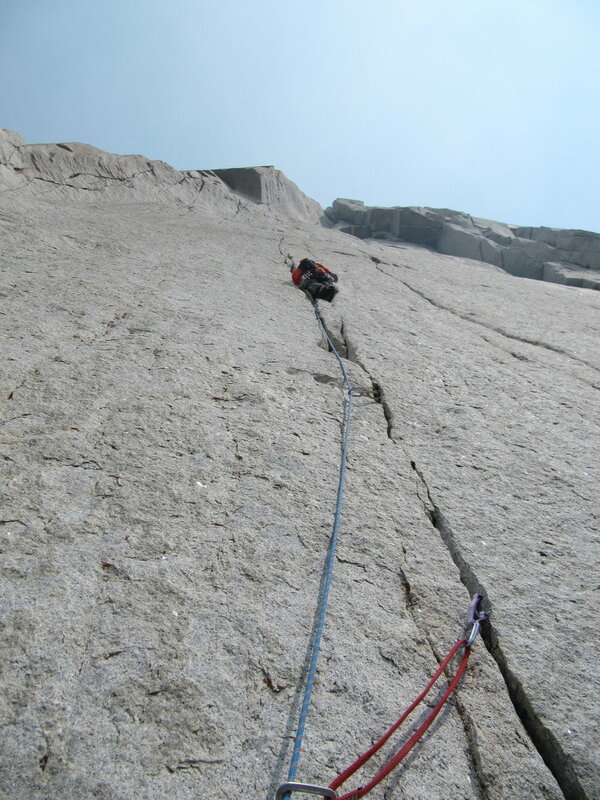 I quickly took the lead and cruised up the second pitch without any trouble. Josh took the third pitch, which consisted of a moderate traverse into a short 5.11+ crux that involved a strange sequence of opposition moves. We both hiked this pitch and arrived at the first crux pitch nice and fresh. The first crux pitch on The Venturi Effect is a hundred foot 5.12+ dihedral dubbed “The Book of Secrets”. Sitting at the belay, I stared in awe at the beauty and the steepness of the corner. I slowly racked up to delay the inevitable; eventually I was going to have to start climbing, and I was probably going to fall. All of the unknowns associated with trying to onsight a hard crack pitch were killing me, I was scared! I forced myself to take a few deep breaths and calm down. I tried to climb off the belay quickly to avoid letting my mind wander toward negative thoughts, which turned out to be a mistake! In the process of rushing through the opening 5.11 moves, a foot slipped and I nearly fell off the route eight feet into the pitch. I down climbed a few moves and composed myself. Spotting some better feet, I climbed the opening sequence with more confidence. Once established in the corner, I took a few deep breaths and began to really focus as I made my way up the first half of the corner. The moves became harder as I climbed higher; the crack becoming more discontinuous and thin as the feet became small and sparse. I was getting tired, but I kept fighting, stemming, pushing, and liebacking up the corner. Twenty feet from the anchor, I was beginning to fall apart. My forearms were pumped, my fingers were tired, and my calves felt like jello. I kept stemming and liebacking like mad, trying to make it to the next belay before my body gave out. I was putting every bit of effort into onsighting this pitch. Just when I thought I was going to send, my right foot slipped and I was sailing through the air. After falling for about 10-15 feet the rope came taught and my downward plummet ended. Exhausted, I rested my head against the wall. A smile crept over my face as I thought about how much fun I was having. What a Route! What a Pitch! In this moment I was too psyched to be afraid of hard climbing and falling on micro gear. I was having the time of my life pushing my limits in the mountains with a good friend. After a quick rest, I climbed the remainder of the pitch with confidence. Josh made quick work of this pitch, only slipping off at the crux. At the belay, Josh grabbed the gear and quickly took off on the next 5.11+ pitch. With confidence and precision technique, Josh ran it out through the crux of another pumpy pitch. This brought us to a deluxe ledge in the middle of the route. Five pitches down five to go. We laughed at the fact that we had just begun to fight our way up the route. Out of the next five pitches one was 11+, two were 12-, and one was 12+; things were about to get rowdy and we needed to bring the ruckus! An uneventful, but fun, pitch of 10- took us up to the first of the shield pitches. Josh took off on the first shield pitch, a beautiful 100 foot bouldery finger crack. He onsighted this pitch without much struggle. Josh was on fire! He had led 3 pitches of 5.11+ and a pitch of 5.12- without falling! I followed the bouldery 12- pitch without falling, but when I got to the belay I was really tired. I sat at the anchor and tried to massage the pump out of my forearms. After a few minutes of this my forearms were still pumped and my arms still tired. It was my turn to lead. Josh, sensing my anxiety, looked up at the sustained, 140 foot, 12- finger crack and said, “well, at least the falls look clean!” He was right, the falls did look clean and the gear looked good enough. I started climbing slowly, milking every rest that I could find. I pictured myself on the traverse at Mesa Rim, resting and recovering as I climbed. My confidence began to build as I continued to climb and link sequences. After climbing about 100 feet I got to the crux. I felt like there was a giant gorilla on my back, dragging me back down towards the ground. I gave it everything that I had, but I came up short and fell. This was the beginning of the end for me. My body was devastated and I fell two more times before reaching the anchor. Josh has incredible endurance and he followed this pitch without falling. Mike leading pitch 8, miles of amazing finger crack! We both sat at the anchor and stared in horror at what we were about to climb. A thin tips crack ran off the belay into an intimidating roof. From there, the pitch made an improbable traverse to a finger crack before traversing again with 2 bolts of 5.12+ slab to the anchor. It was Josh’s turn to lead and he gave this pitch every last bit of energy that he could. After numerous falls he made it to the anchor and put me on belay. It took every last drop of effort to link the first half of the pitch. I fell my way up the last half of the pitch and arrived at the belay destroyed. I felt sick; the smoke from the Rim Fire had rolled back in and we were both coughing violently. Destroyed, we decided to save the last pitch for our next attempt and rappel back to the ground. Numerous rappels with our 80m rope, and one stuck rope later, we were back on the ground. We were both psyched about what we had accomplished that day. We weren’t able to send the route, but that didn’t matter. We had a great time pushing ourselves on a wild route in an amazing location. Its days like these that motivate me to become a better climber and continue to try hard. The Venturi Effect had beaten us, but we’ll be back to square up with it again.